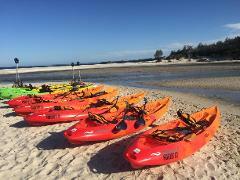 Specialised Fishing Kayaks are available for Hire at the Jervis Bay Kayak & Paddlesports store in Huskisson. With the pristine Jervis Bay Waterway directly opposite our store this is a great way to enjoy a relaxing paddle with spectacular views and only a short paddle to get outside the Marine Park (where no fishing is permitted) and try your luck. 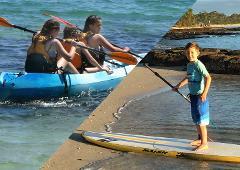 Kayaks are available during Shop hours and for Take Away Hire for multiple days. Please contact the store directly if you would like to book for multiple days. you will require a safe method of transport (roof racks) and secure location for storage overnight. Our Fishing Kayaks are the Wilderness Systems Tarpon 12 which include 2 flush mount rod holders, a 700gm anchor and cleat, adjustable rotating rod holder, life jacket, dry bag, trolley and plenty of space for your gear and catch! Please note that it is a requirement of hire that all participants hold a valid NSW Fishing License and are able to swim confidently. A full safety and weather briefing will be provided to make sure you enjoy the activity in safety, along with a map and briefing on the Marine Park boundaries.